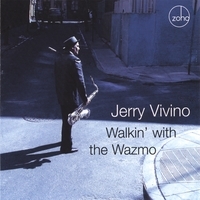 Funky, upbeat and robust New York-style Hard Bop and R&B session, featuring tenor saxophonist Jerry Vivino - member of the Max Weinberg 7 on the Conan O'Brien Show. Walkin’ with the Wazmo is definitely a good time. From the jivey title track (which would’ve been a natural for Louis Prima) to his inventive, second-line interpretation of Sonny Rollins’ “Pent Up House” and his Latin flavored take on Herbie Hancock’s “Dolphin Dance” to his vocal cover of Louis Jordan’s “Knock Me A Kiss,” it entertains in upbeat fashion as it swings. Add in the slamming B-3 fueled funk of “The Fried Piper,” the boppish romp “Cats ‘R’ Us,” the Latin son groove on “Dorado Beach” and the alluring samba of “Bellissima” and you’ve got Vivino cutting a wide swath stylistically while having a ball in the process. On tenor sax, Vivino flaunts a big, robust tone in the tradition of his honking heroes Sam Butera, Red Prysock and Willis “Gatortail” Jackson. “I admire so many different tenor players, but those are the three who really hit home with me and helped mold my style,” says the New Jersey native. Vivino is joined on this diverse collection of eight originals and three cover tunes by a flexible crew of fellow NYC session cats, including including trumpeters Lew Soloff and Michael Morreale, valve trombonist Mike Fahn and pianist Brian Charette. The session is grounded by the solid rhythm section work of drummers Shawn Pelton (a regular in the “Saturday Night Live” house band), James Wormworth (Max Weinberg’s sub in the Max Weinberg 7), and Ray Marchica. These great drummers work in tandem with bassists Mike Merritt (Vivino’s longtime bandmate on the Conan O’Brien show) and Kermit Driscoll (a former member of Bill Frisell’s quartet). Jerry’s guitar playing brother Jimmy Vivino (also a regular and assistant musical director on Conan’s TV show) contributes some stinging licks on the title track. Soloff ignites the boppish “Cats ‘R’ Us” with his signature high note trumpet playing while pianist Charette pushes the harmonic envelope with some adventurous McCoy Tyner-ish flurries on “Pent Up House.” Vivino provides some accomplished flute work on the soothing “Dorado Beach” then blends nicely with alto flute and Mike Fahn’s valve trombone on the hauntingly beautiful 6/4 ballad “Montelena Circle.” Jerry blows some urgent tenor lines over the modal vamp of “Red Moon” while Soloff adds some animated plunger work on trumpet, a la Bubber Miley. On flute Vivino deftly navigates the tricky head of “The Fried Piper,” a tune that is seriously grounded by Mike Merritt’s funky Fender basslines in combination with James Wormworth’s slamming backbeats, Fred Walcott’s percussion and Charette’s Jimmy Smith styled B-3 work. It’s just a matter of knowing which hat to wear. And Vivino wears them all well. Produced and arranged by Jerry Vivino. Recorded at Tedesco Studios, Paramus, NJ, on January 9 – 12, 2006. Engineered, mixed and mastered by Tom Tedesco at Tedesco Studios. Executive Producer: Joachim Becker.